Unpub welcomes you to the main Event, Unpub 4. The annual unpublished games festival in Dover, Delaware. Saturday and Sunday are our play testing extravaganzas from 10am-8pm. Admission is free for play testers, ample parking is available, and food can be purchased to support the St. Thomas More Drama Program. If you would like to bring your own snacks and beverages, feel free. Both days will wrap with announcements and prizes! Before play testing starts on Sunday, a free pancake breakfast for our second annual Publishers and Pancakes will begin at 9am. Pancakes will be available until they are all gone, but while enjoying breakfast, those is attendance will be able to ask attending Publishers burning questions about game design and submission. On Friday January 17th, Designers and Publishers are invited to join together for an evening of Dinner with the Designers from 8pm to 11pm at Grotto Pizza in Dover, Delaware. With Saturday and Sunday being busy with playtesters, designers often do not get to try or talk about one another’s games. This will afford all designers an opportunity to mingle, chat about games, and out in some early play testing time with one another. This is a cool kid hang out so you better be there and a RSVP is required. Designers and Publishers will be treated to unlimited pizza and soft drinks. For Unpub 4, what time do the events usually start? Wow! 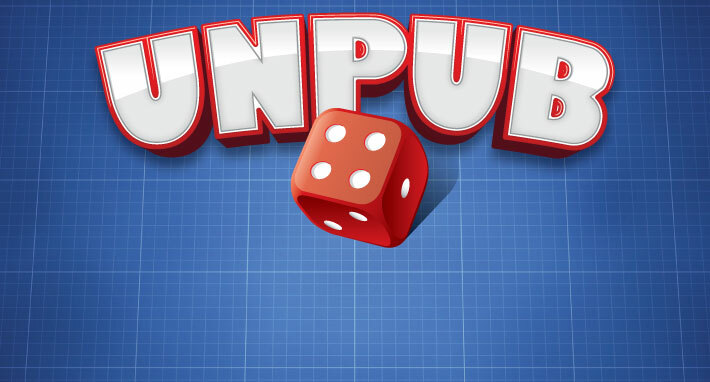 Unpub is back and better than ever!!! The only thing I’d wish for is that it was held at a hotel so the kids would have a place for them to crash when they get overloaded. Will there be a list of Publishers who plan on attending? How does one sign up to have playtesters?